Tim Cahill’s big-game experience and ability to be a match-winner for the Caltex Socceroos is likely to outweigh his lack of game time at club level in his hopes of making a fourth FIFA World Cup. Cahill was on Monday named in Bert van Marwijk’s 32-man preliminary squad, which will be trimmed to 23 for the tournament in Russia. There have been question marks over Cahill’s spot in the squad, with the 38-year-old playing a total of just 63 minutes since his move to English Championship club Millwall in January. While he didn’t guarantee Cahill’s selection in the final squad, van Marwijk dubbed the situation regarding Australia’s greatest-ever scorer as a “special case”. “I had long conversations with Tim in Norway [in the March friendlies] and he is a special case,” van Marwijk told reporters on Monday. “He is special in everything. He is 38 and maybe one of the best-ever players for Australia. He is a very good striker. “He doesn’t play [much at the moment], maybe five or 10 or 20 minutes. 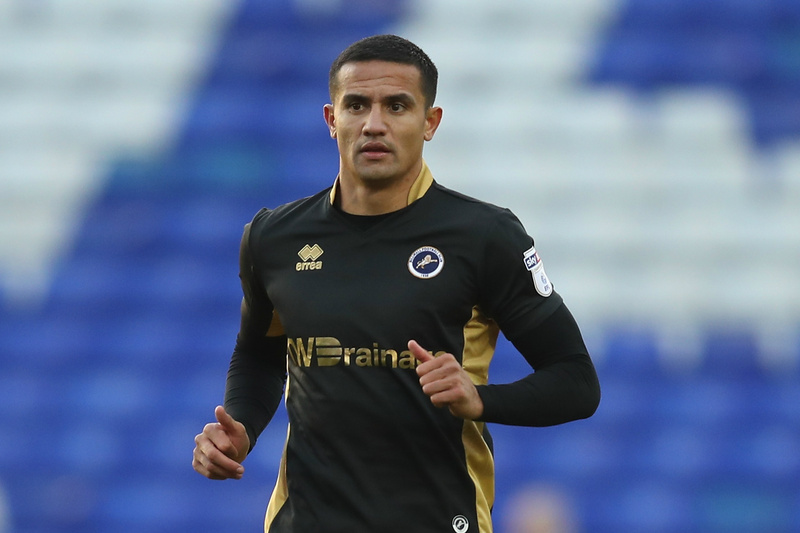 Tim Cahill played just over an hour since his switch to Millwall. Cahill is aiming to join a select group of players to not only to play at a fourth FIFA World Cup but also score in one. And throughout his career Cahill has often been a saviour for the Caltex Socceroos, scoring important goals and often making the difference on the big stage. “He is not 19 like [Daniel] Arzani, he’s twice as old, but is also a player who can make a difference,” van Marwijk said of Cahill. “He will not be nervous if we play in front of 80,000 people. Van Marwijk is expected to trim his squad to 26 or 27 players next week before flying off for their pre-FIFA World Cup camp in Turkey. That’s where the squad will go through a rigorous training regime for three weeks before the Caltex Socceroos boss must settle on his final 23-man squad for the tournament. Australia opens their FIFA World Cup campaign with a game against France in Kazan on June 16. Brisbane: Socceroos legend Tim Cahill’s second-half brace sent Australia past China 2-0 and into the AFC Asian Cup semi-finals on Thursday. Cahill opened the scoring shortly after the break before doubling the lead midway through the second-half with arguably the goal of the tournament as Australia reached the last four for the second successive time. Ange Postecoglou’s side will face either holders Japan or the United Arab Emirates in Newcastle on Tuesday for a place in the January 31 final in Sydney. Shortly after Korea Republic punched their semi-final ticket with a 2-0 extra-time win over Uzbekistan in Melbourne, China got off to the better start as Australia, looking slightly nervous, struggled to settle into the game between the Group B winners and the Group A runners-up at Brisbane Stadium. The Chinese strike-force of Sun Ke, with three goals from three games in the group stage, and Wu Lei caused problems for the Australian defence, calling goalkeeper Mat Ryan into action several times with their pace and ferocity. But the good times would not last for China, who could have put Australia under serious pressure had they scored within the first 30 minutes. Controlling more than 77 per cent of possession in the first half, Postecoglou’s men eventually found their feet, going close a couple of times before the break that allowed them to regroup for the second half. And in the 49th minute, Cahill did what he does best – score in time of need for the Socceroos. China cleared a corner from the right but Mathew Leckie headed right back into the box to keep the attack going. Cahill took advantage of a moment of freedom and hit an acrobatic overhead kick past goalkeeper Wang Dalei, who never saw it coming, reacting too late to the spectacular effort that put the hosts into the driver’s seat. The deficit forced China to come out, giving Australia more space to work with, and it was Cahill again who capitalised five minutes past the hour, powerfully heading home a cross from left-back Jason Davidson to make it 2-0 and effectively put the game out of their opponents’ reach. The Socceroos have overcome a nervy start to lay down an impressive marker for their Asian Cup campaign, winning their opening match against Kuwait 4-1 in Melbourne. Goals to Tim Cahill, Massimo Luongo, Mile Jedinak and James Troisi cancelled out Ali Hussein Fadhel’s early strike as a raucous crowd found full voice on a rainy night at Melbourne Rectangular Stadium. Expectation circled the Socceroos before kick-off, with a good result seen as essential to get off to a positive start after a poor run of results since the 2014 World Cup. But the opening of the match hardly went to plan for the Socceroos. Appearing more than a little nervous on such a big occasion, Kuwait took its opportunity to steal ahead from a smart set piece in the eighth minute. As a number of Kuwaiti players peeled off to the back post, causing their Socceroos markers to follow them, Fadhel held his position at the front post and dived ahead of Cahill to nod home. It was a cleverly created and smartly taken goal, and succeeded in rocking both the home crowd and players as the tempo dropped and Australia looked the weaker team. In time, though, the Socceroos found their groove, making a number of confident surges into the penalty area and winning fouls in dangerous areas, only for the chances on goal to dissapate. But if anybody was going to make the difference for Australia, it was going to be Cahill. The veteran was the beneficiary of some outstanding work by Luongo in the 33rd minute, who skipped past a handful of defenders to get the byline and square up towards Cahill who was, of course, perfectly placed. The finish was as unerring as expected, the New York man slamming home with his right boot to set off the trademark celebration and settle Australia’s nerves. The Socceroos stayed on the front foot for the rest of the half, and were rewarded again just before the whistle when Luongo met Ivan Franjic’s expertly weighted cross in Cahill-esque fashion to take the lead in the 44th minute. Any thoughts the break came at a bad time for Australia were quickly dispelled as the Socceroos started the second half as it finished the first, immediately going on the attack and closing in on a crucial third goal. Mathew Leckie hit the bar, and a few other chances fizzled out, but when Robbie Kruse was clipped in the area in the 62nd minute and the referee awarded the penalty, Jedinak was unerring with the finish. Kuwait came back into the game as Australia made changes from the bench, with keeper Mat Ryan called on to make one stunning save to keep the two goal buffer, but the hosts always looked likely to find another goal. Recalled Nathan Burns hit the bar with a stunning header, Tomi Juric fired shots straight at the keeper but Troisi found a way through in the final moments, belting one inside the near post from a tight angle after Leckie’s tricky build up play in the 91st minute. While it was far from a perfect Socceroos performance, Kuwait was left wanting at crucial times thanks to the home side’s power of will and pace on the counter, and next opponent Oman will have its hands full to stop the momentum. Tim Cahill says his ankle has recovered enough to be fit for selection for the Caltex Socceroos in Wednesday night’s World Cup qualifier second leg intercontinental playoff with Honduras. Cahill went into the first leg under a cloud after injuring his ankle playing for Melbourne City just days before leaving for the first leg in Honduras. He didn’t feature in the 0-0 draw in San Pedro Sula, watching on from the bench. Now, after a week of rehab and recovery, he’s declared himself fit and ready for battle – potentially from the start if need be – saying that he could’ve even played a part at the Stadio Olimpico Metropolitano. “I feel great. If I had to play in Honduras I definitely would’ve made a contribution. “That’s what it’s all about, putting your body on the line and sacrificing. “These two games are such a big occasion for our country being the fourth consecutive chance to get to another World Cup,” he told a large media contingent on Monday. The Australians arrived on a charter flight back into Sydney on Sunday around midday. They had a light session later that day and will have another session on Monday night, both at Stadium Australia. Compared to the commercial flight Honduras took (arriving on Monday), on paper at least, the Australians should be fresher. “It’ll play a massive part,” Cahill conceded when asked about the charter flight and the hi-tech recovery techniques employed by the team’s backroom staff. “The boss’s emphasis is to be smarter than other countries when it comes to two legs. “The professionalism is a major factor. It’s fantastic. This is normal procedure when you play in the Premier League and getting back [from a game] on private charters. “It’s something that helps you get the edge [in sport]. “It’s about being elite and making sure you take advantage of having a great set up. He didn’t play in Honduras and it’s not clear if he’ll even start in Wednesday night’s winner takes all second leg inter-continental World Cup playoff, but Tim Cahill will be crucial for the Australians says Trent Sainsbury. “He’s one of those people who can psyche you up before a game and afterwards if you need help with other things he can talk you down from that. 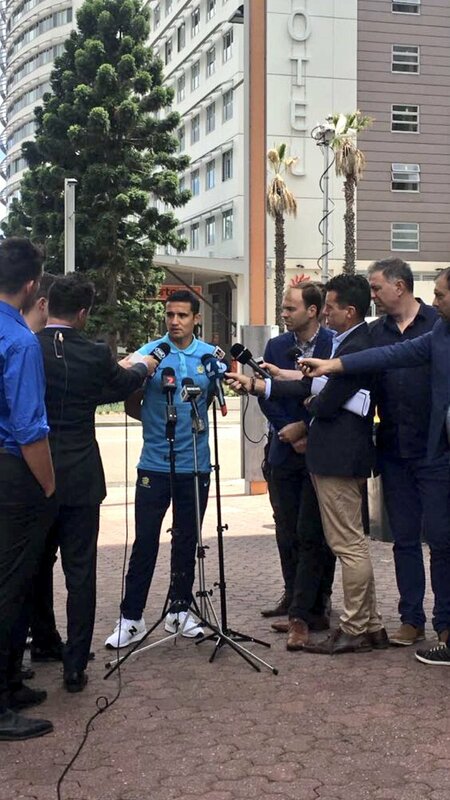 “He’s one of those people who’s always special to have around – that’s why he’s ‘Super’ Timmy Cahill,” the Caltex Socceroos defender told the waiting media at Sydney airport on Sunday. A special charter flight ensured the players recovered as well as possible ahead of their second leg winner-takes-all clash on Wednesday night at Stadium Australia. 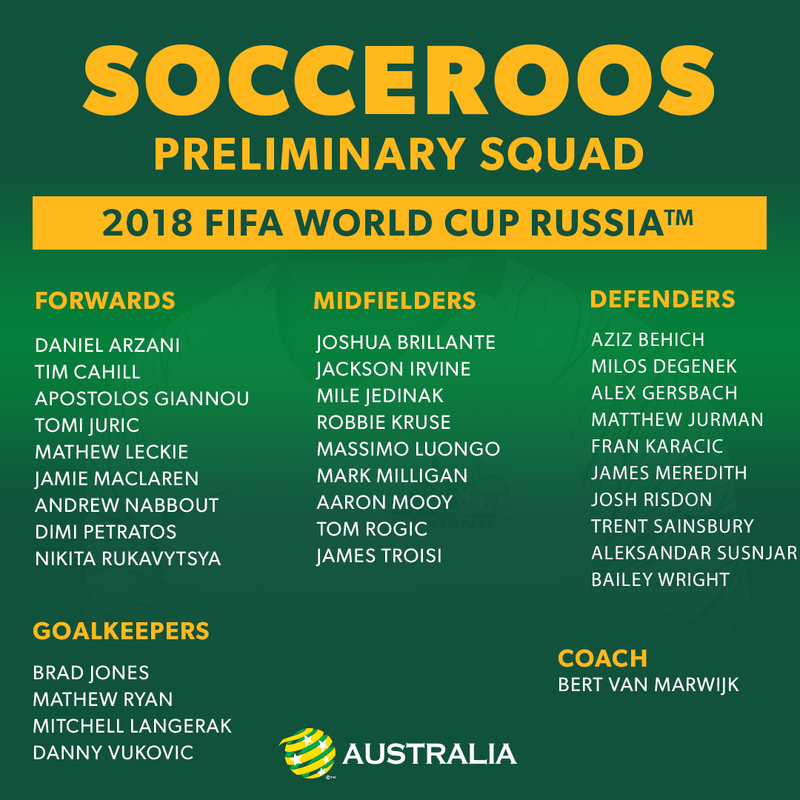 And if Cahill does play on Wednesday, he’ll add to the experience that Mat Leckie and Mark Miligan are also likely to bring to the Australians as they look to make it four World Cup qualifications in a row. Milligan and Leckie were suspended for the first leg at San Pedro Sula’s Stadio Olimpico Metropolitano while Cahill came into the first leg with a much publicised ankle injury sustained a week ago. “He’s [Cahill] looking fabulous as always. Tim is such a great leader with quality. “They’ll bring a lot of caps back in the team. Having their qualities back is a major boost for us,” said Sainsbury, who was excellent for Australia in a display that included a superb defensive tackle in the first 10 minutes against Honduras. Australia is in a good position heading in to the second leg in Sydney after an impressive display in a 0-0 draw away to Los Catrachos on Saturday (AEDT). “I don’t think we’ll change too much. I can’t see them [Honduras] changing too many things, they may tweak things but we’ll be ready,” Sainsbury added. Sydney: Veteran goalscorer Tim Cahill remains indispensable as Australia head into their FIFA World Cup 2018 Russia Intercontinental Play-off with Honduras – even when he’s injured and rapidly approaching his 38th birthday. Cahill’s enduring value was in evidence this week when he flew out to Honduras, wearing an ice pack and accompanied by a medic, despite badly twisting an ankle in the A-League days earlier. Cahill, who is no certainty to play, said it was a “calculated decision” to travel for the first leg as Australia attempt to reach a fifth FIFA World Cup next year in Russia. Even if he doesn’t start in San Pedro Sula on Friday, Australians will be hoping their perennial match-winner will be back to his best by next week’s make-or-break second leg in Sydney. The former Everton striker has played in the last three World Cups and lifted the 2015 Asian Cup with Australia, but his will to win – and his eye for goal – remain unsurpassed. There’s no better example than his two signature headed goals to guide Australia past Syria in the Asian playoff to set up the showdown with Honduras, the fourth-placed side in CONCACAF qualifying. Last Friday, Australia’s football fans collectively held their breath as Cahill painfully twisted his ankle playing for Melbourne City. Scans revealed no ankle fracture, and Cahill was allowed a day’s extra rest to let the swelling subside before making the long flight to Central America. “It’s a massive two weeks for Australian football, but I wouldn’t be doing it if I thought it was the wrong thing,” he said before leaving on Monday. Australia coach Ange Postecoglou is fully aware of what Cahill brings to the table, given his indomitable attitude and 20 years of playing experience in England, the United States and China. “He’s just a freak,” Postecoglou said after Cahill’s fairytale double against Syria. Australian-born Cahill’s CV makes extraordinary reading. He began playing for Western Samoa U-20s and only became a Socceroo in 2004 after an intense lobbying campaign to world body FIFA. He went on to become the first Australian to net a goal at the FIFA World Cup in Germany two years later, and has scored in three World Cups (2006, 2010, 2014) in total. His stunning volley against the Netherlands in Brazil was voted by FIFA as one of 2014’s greatest goals. Apart from his record international haul, in 2007 Cahill was also the first Australian to score at an Asian Cup, and his goals in 2015 – including a memorable bicycle kick against China PR – helped them lift the trophy on home soil. He returned home last year to play with Melbourne City and remains at the fulcrum of the Australian national team, 13 years after his debut against South Africa in March 2004. 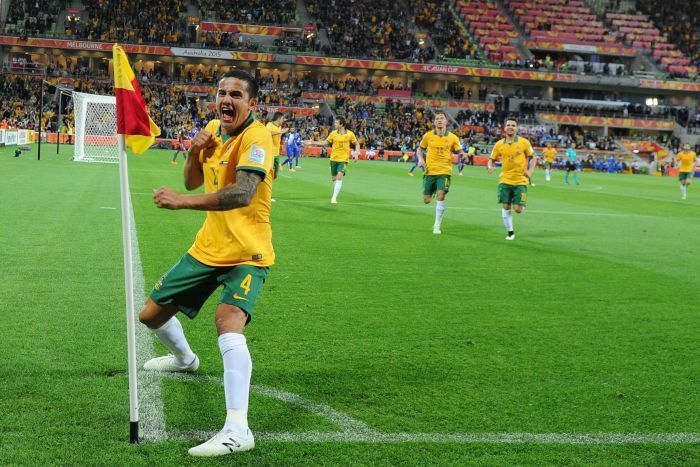 Australian fans have adopted the phrase “cometh the hour, cometh Tim Cahill” given his knack for scoring just when a goal is needed on the big occasion. Cahill is a coach’s dream, and his hunger to run and compete for everything is unmatched even now by his much younger national teammates. “It’s the biggest two weeks of our lives. If we get to a World Cup, that’s all that matters,” Cahill said. Tim Cahill has vowed to “do anything” to be available for the first leg of Australia’s winner-takes-all World Cup playoff against Honduras. 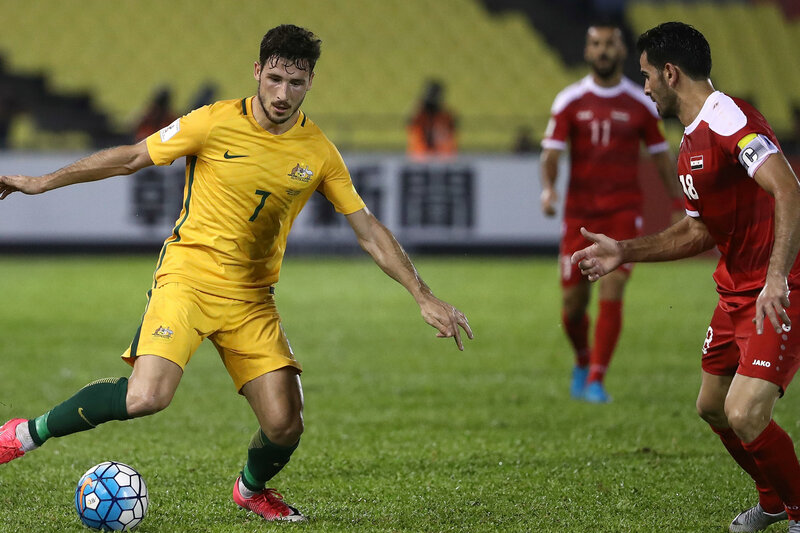 The Caltex Socceroos talisman has linked up with the side in Honduras, but he’s in a race against time to be fit for Saturday morning’s match after injuring his ankle on Friday night. But it was an optimistic Cahill who touched down at San Pedro Sula airport. “I’m here – I’m with the team,” Cahill told reporters upon his arrival. “I’m making sure I’m doing everything possible to be a part of it. “I can’t promise anything – all I can promise is that I’m working hard. “It’s my country – I’m very proud – and I’ll do anything to be available,” Cahill said. Cahill was quick to douse any fears of hostility or violence from the home fans during their time in the Central American nation. “For us as players we respect the country and the people, which is most important,” he said. “What the media says is different from what the players think. “We have the utmost respect and the country is a beautiful place. “We’re coming here to play football so it’s about enjoying that occasion and taking in the surroundings,” Cahill added.